KE00080 is a solid phase sandwich Enzyme Linked-Immuno-Sorbent Assay (Sandwich ELISA). 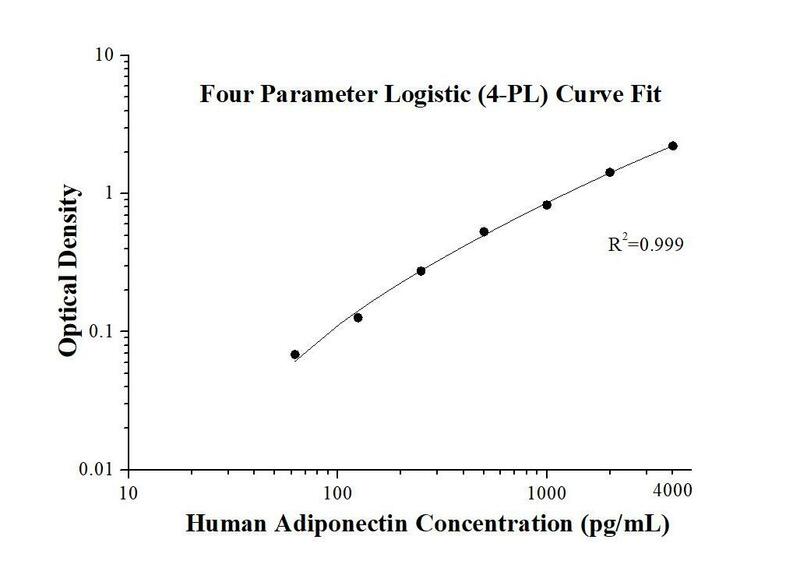 The Adiponectin ELISA kit is to be used to detect and quantify protein levels of endogenous Adiponectin. The assay recognizes human Adiponectin. A monoclonal antibody specific for Adiponectin has been pre-coated onto the microwells. The Adiponectin protein in samples is captured by the coated antibody after incubation. Following extensive washing, a monoclonal antibody of biotinylated specific for Adiponectin is added to detect the captured Adiponectin protein. For signal development, Streptavidin-HRP is added, followed by Tetramethyl-benzidine (TMB) reagent. Solution containing sulfuric acid is used to stop color development and the color intensity which is proportional to the quantity of bound protein is measurable at 450nm with the correction wavelength set at 630 nm. Adiponectin (AdipoQ), an adipocyte-derived hormone, is one of the most abundant adipokines in the blood circulation. Adiponectin modulates a number of metabolic processes, including improving insulin sensitivity and anti-inflammatory activity. The role of Adiponectin in reproduction is not yet fully understood, but the expression of Adiponectin in reproductive tissues has been observed in various animals and humans, including chicken testis, bovine ovary, and human placenta. Adiponectin exerts its effects by activating a range of different signaling molecules via binding to two transmembrane Adiponectin receptors, AdipoR1 and AdipoR2. AdipoR1 is expressed primarily in the skeletal muscle, whereas AdipoR2 is predominantly expressed in the liver. Adiponectin May play a role in cell growth, angiogenesis and tissue remodeling by binding and sequestering various growth factors.